Ever want to go kayaking? It does sound fun – sitting yourself in a close-to-water boat, while propelling it forwards with a double bladed paddle. It’s one of those activities that should be up there on your bucket list. In recent years, kayaking has been growing in popularity and different designs are being developed. Why not jump on the bandwagon and start kayaking with some of the best inflatable sea kayaks on the list below. Kayaking on the beach on an inflatable sea kayak is also great for exploring and discovering hidden gems you may not have seen otherwise. Also, you’ll save money by not having to rent out a kayak by the beach, which can be quite costly, especially during peak season. Buy your own blow up kayak and there is no time limit. Now, you might ask, why inflatable? Surely, plastic or fiberglass kayaks would be much better, but you should consider that each material has its benefits. With inflatable kayaks, they can be deflated, transported, and stored away easily. Additionally, they are surprisingly durable. Kayaking can be a fun activity for yourself, two, or even three, and it’s also a great way to keep fit! When inflated, grows to the size of 312 x 91 x 51cm. Take another person kayaking with you – this one fits two! Maximum weight of 160kg. Streamline design allows for easy sailing and spacious cockpit allows for comfort. 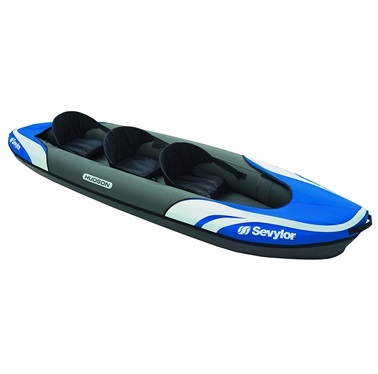 Includes two 86” aluminium oars, as well as a high-output pump to help with inflating and deflating. A grab line on both ends for your convenience and a removable skeg for easier directional stability. Rugged vinyl construction and bright yellow design for noticeability. Oars aren’t very durable – prone to snapping. Take someone on a kayak ride with you because this one of the best 2-person inflatable kayaks! With two 86” aluminium oars, paddle your way through serene water areas with ease, thanks to the streamlined design that helps with easy sailing. Stretch your legs out in the spacious cockpit – you don’t have to fret about the possibility of getting pins and needles! For your convenience, the skeg is removable and there is a grab line on both ends of the kayak. 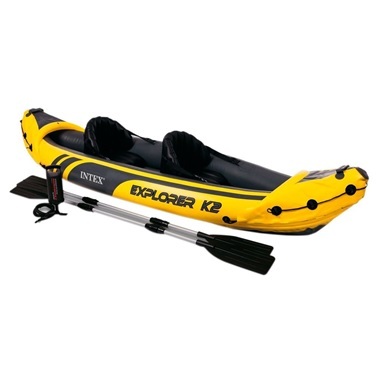 The seats are inflatable and adjustable with a back rest, so if you value comfort above all else, you should definitely consider Intex’s Explorer 2 person inflatable kayak. Dimensions of 351 x 76 x 38cm when inflated. Suitable for one or two people – can manage up to 160kg. Highly visible, thanks to the sporty graphics and the bright green colour. Sail with ease because of the streamlined design and space out in the cockpit. 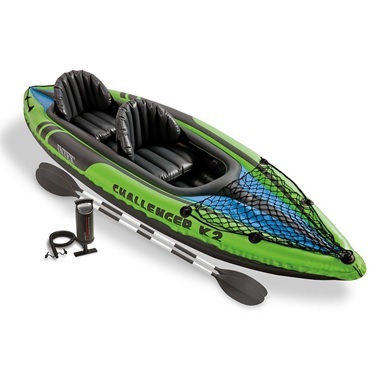 Comes with a high-output pump and 84” paddle oars, as well as a cargo net for extra storage. Removable skeg, a grab line on both ends, and adjustable, inflatable seats with a backrest. Seats do not provide much comfort nor stability. Intex’s Challenger kayak is much like the Explorer kayak, but it takes on a different design and also comes with a cargo net. This can be used to store water bottles (remember to keep hydrated!) and your personal belongings in a waterproof dry bag. There is also space within the cockpit and the seats are adjustable for your comfort. So that your temper doesn’t flare, the streamlined design of the boat allows for smooth sailing. If you are a sporty person who likes their sporty items, then feast your eyes on this beauty with its sporty graphics! You also don’t have to go through the hassle of finding kayak paddles because this kayak comes with two of them. Additionally, you don’t have to be lonely because this kayak can fit two! Inflates to the size of 274 x 76 x 38cm. Suitable for just one person – maximum weight of 80kg. 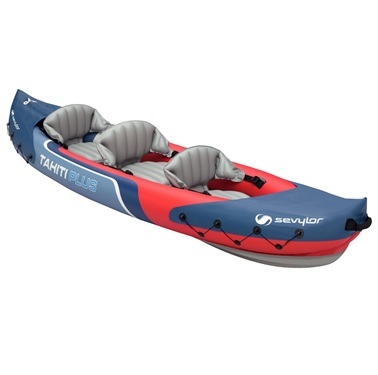 Comes with a high-output pump and an 84” aluminium oar. Adjustable, inflatable seat and cargo net for extra storage, while kayaking. Streamlined design for easier paddling and green in colour for noticeability. Seat isn’t very well connected to the main body, as it is prone to tear away. Perhaps you prefer to fly solo – if that’s the case, then you should definitely check out this kayak which is one of the best blow up kayaks for one person. Place all of your stuff in the cargo net in front of you and be ready to set off into water with your 84” aluminium oar – the adventure is about to start. Taller users may find it a bit more of a tight squeeze, if you’re over 5ft 10”, it’s probably best to steer clear of this one person inflatable kayak. However, if you’re below that height then you should have enough leg space in front and a comfortable seat to sink in and can cruise peacefully in this kayak. Inflates to 361 x 88cm and can carry up to three people (two adults and one child) – a maximum weight of 200kg. Broad shape of kayak provides both stability and comfort, and the two inflatable kayak seats can adjusted, inflated, or removed, as you wish. Combined spray deck at bow and stern, as well as integrated pressure gauge for more precise inflation. Equipped with a durable PVC hull, two PVS side chambers, and a floor chamber with I-beam construction for stability and safety. Taking it back to your car? Strap it up and wear it like a backpack! Highly portable. No skeg for directional steering. You ever dream of a three person inflatable kayak? No? Well, this is a great one anyway – it can fit two adults and a child (with a combined weight of 200kg) and is highly stable, thanks to the shape of the kayak, as well as the I-beam construction. There’s more than just stability to this kayak, though – it is also comfortable! The kayak seats can be adjusted, inflated, or removed, so that you can really get yourself comfortable. Best part about this blow up sea kayak is how you can fold it up into something like a backpack. Now, you don’t have to drag it along the floor, over rocks and mountains – you can simply strap it up and swing it over your shoulder. Dimensions when completely inflated 374 x 89cm – ideal for two adults and a child with a maximum combined weight of 210kg. 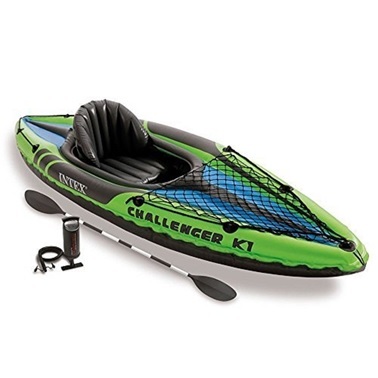 Pump up this kayak with the manometer, knowing that you are in control of the pressure exerted. Fold it up and put it in the included large bag for better portability or carry it using the carry handles. Air can easily be let in or out through the easy inflation values. Kayak is as durable as it can be – with a sturdy polyester hull, two PVC side valves, a floor chamber with I-beam structure, and a heavy duty tarpaulin shell, you can rely on it. Comes with a manometer, a fin, a kayak carry bag, and a boat repair set, so that you don’t have to buy it separately. With three people, space is limited. 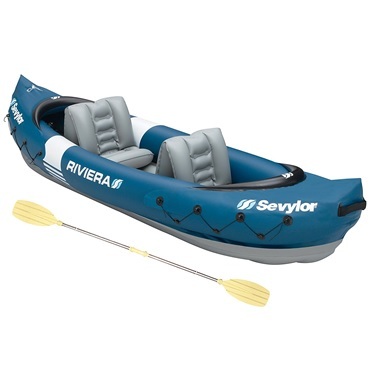 Sleek and smooth sailing – and this Sevylor inflatable kayak can fit three people! Not only is it durable, but it is also portable – it can fold up, then be carried around in the included bag. When you inflate this kayak, you don’t have to fret about the pressure being too low or high because the manometer will handle that for you. In addition, the two-way valves enable you to control the air pressure as you can simply let air in and out. Multiple independent chambers improve safety and stability, the large outer chambers help gain extra stabilisation when the weight capacity in the kayak is increased. Ideal if you’re not too keen on capsizing! Definitely one of the best 3 person inflatable kayaks out there. Full size 315 x 84cm, large enough to fit two people with a combined weight of 180kg. Broad outline provides stability and inflatable chairs are designed to be comfortable, as well as easy to adjust and remove. Portable, thanks to the clever backpack system, which allows you to wear the kayak as a backpack. Highly durable because of the PVC hull, two PVC side valves, and I-beam construction of the floor. Accurate inflation is also guaranteed due to integrated pressure gauge. Comes with a paddle and a boat repair set. Paddles are plastic, not aluminium, therefore fragile. 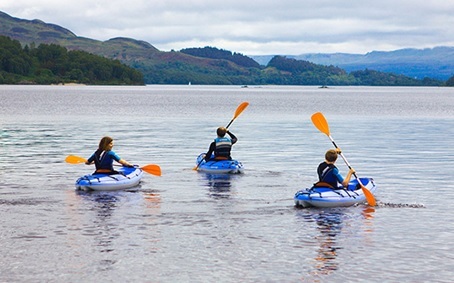 Ideal for lakes and seashores, you can take someone with you kayaking. There is plenty of space in this kayak and the seats are also comfortable, so you don’t have to continually move about to get comfortable. This 2 person inflatable kayak is also stable and easy to inflate, as well as portable due to the enhanced backpack system, which allows you to haul the kayak over your shoulder since it’s in the shape of a backpack. At 331 x 88cm, it can carry two people with a more generous maximum weight capacity of 200kg. Two inflatable kayak seats, which are also easy to adjust and remove, will provide comfort for you and your kayaking partner. Easily inflate and deflate this kayak with help from the Boston valves and be in control of the pressure with help from the manometer. Durable, stable, and safe on the water, thanks to the polyester hull, PVC side valves, and the tarpaulin shell. Vivid yellow for noticeability on the water. Also includes a manometer, fin, kayak carry bag, and a boat repair set. Ideal for those slightly heavier kayakers, thanks to the maximum combined user weight of 200kg. 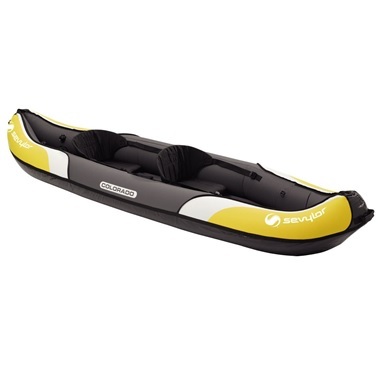 Although quite a lot more expensive than our best inflatable sea kayak the Intex Explorer K2 Kayak, with the Sevylor Colorado, you know you’re paying for quality. Its inflatable seats which are comfortable, easy to adjust, and not a hassle to remove, and enough space for two people, regardless of height. The tarpaulin shell provides another level of stability to the kayak and the manometer ensures that you haven’t over-inflated your kayak. If you find inflating and deflating the kayak a tedious task, know that the Boston valves are on your side and will make inflating and deflating less of a hassle.